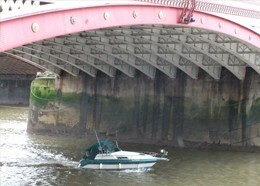 London River Police rescue a fallen airman who has baled out and parachuted into the Thames. Another two parachutes are visible in the distance. The scene symbolises events during the Battle of Britain, in which 200 airmen were killed or went missing in the waters around England. Because of this, an air/sea rescue service was formed with the aid of the Royal Navy and RAF Lysander aircraft. In the background, St. Paul’s Cathedral is visible through fiery skies over the City and East End. Throughout the darkest days of the Blitz, the Cathedral stood as a beacon of hope for the people of London - a miraculous symbol of resistance and survival. The artist almost certainly incorporated the Cathedral into the painting because of this widely-held belief. The portrayal of St. Paul’s in this view of Blackfriars Bridge is similar to a famous photograph of December 1940 taken by freelancer Herbert Mason which captured the Cathedral standing defiant amid clouds of smoke and a sea of flame. 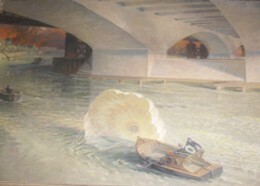 Platt's painting was later used by the British government in its efforts to convince the United States of the justice of the British cause and to enlist desperately-needed material aid. This page was added by Hayley Clarke on 04/09/2010.